Opening reception for the Young Collector's night at The NY Winter Antiques Show... Ah! that satisfying fashion parade that is the annual Winter Antique Show. Most of all, stunning necklaces… were the fashion statement of this year's antique show. 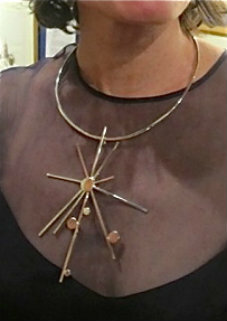 Lauren Chisholm, a skilled goldsmith from Darien, wears her own orbiting creation.